The Ensign Drafting Art Table is an example of practicality, convenience, and functional design. 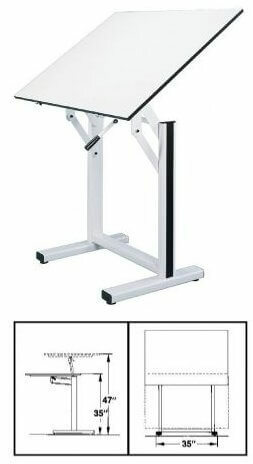 Tabletop height and angle are spring-action controlled. This semiautomatic design provides simultaneous height and tilt adjustments employing an extendable single action lever, conveniently located just beneath top on the right hand side. I would rate this product at 4 and a half stars if I could as overall I think this is an excellent product and I have only minor objections. I purchased the Alvin Ensign table with the 36x48” top in January 2015. It arrived promptly and in good shape. The set up and adjustment instructions were clear, the procedure straightforward and took less than an hour. The product comes with a 17 mm open end wrench to adjust the lift-strength. I would definitely suggest using a socket wrench with a short extension as the adjustment nut is recessed and would difficult to turn with the provided wrench. As of this writing I have not used the table extensively and therefore cannot attest to how well it will hold up over time but I don’t anticipate that there should be any problems. Visually, in my opinion, the table would not fit into the category of slick beautiful office furniture but it is a simple straightforward design and not objectionable. The white paint is a little harsh (a little too blue). I would have preferred a softer white such as used by Apple Computers or the Elfa shelving systems. The adjustment procedure is an elegant concept and the mechanism works very well. The table is quite sturdy and does not give when leaning on the edge. There is a slight lateral jiggle but I don’t find it a big problem. If this gets worse over time I may choose to cross brace the frame with some light steel cable and turnbuckles. The current model that was shipped to me is slightly different from the image depicted online. The brake lever is under the table top on the right edge which makes it easily accessible but not in a place where it is likely to be bumped and released unintentionally. When researching this product I found a lack of dimensional information and in some cases conflicting information. I’m providing some approximate dimensions here that may be useful in determining whether this product is appropriate for your purposes. These dimensions are based on the 36”x48” top and thus some of them will be different with the smaller top. In the horizontal orientation the table top can be adjusted from 37 ½” to 46” above the floor. In the vertical orientation the top edge of the board can be adjusted from 48” to 69” above the floor. With the table set at a 25 degree angle the front edge is 29” above the floor. It would be ideal if the table went an inch or two lower, but even as it is I think one would be comfortable drafting when sitting in a low (20”) seat or standing. Overall, a very nice product and I would recommend it to others.